In what has to be the strangest/most bizarre costume I have ever come up with, my priest, Meridiane, attended the Anti-Drama Commonwealth’s Halloween party last week as THE POPE. the Tyrannical Gladiator’s Mooncloth Helm !!! I will be submitting my idea to Dress Up! by Batinna for her Halloween category. 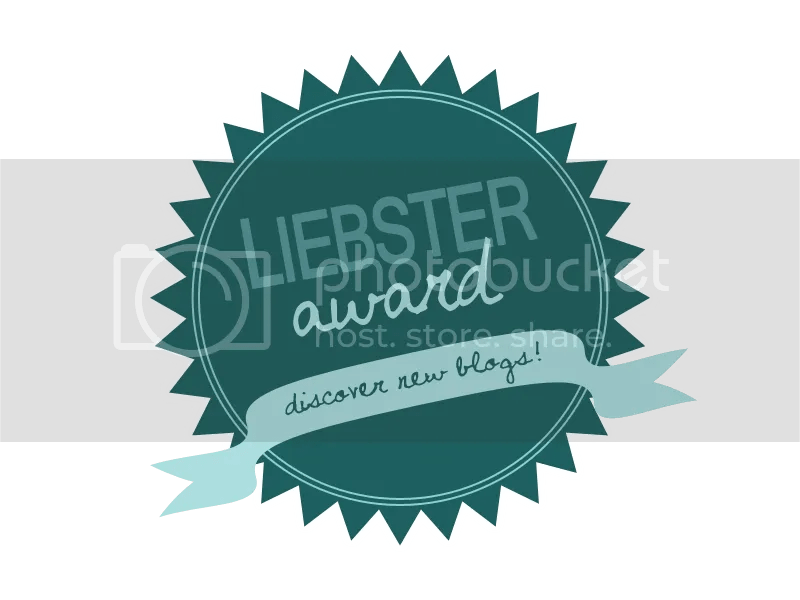 She posted this blog contest a while back, but I did not see it until this past week, and she is still taking posts here and on twitter in 15 different categories. 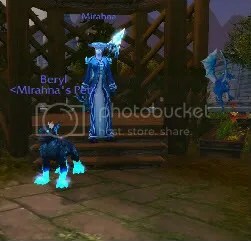 Then she will be posting different ones she picks in transmog videos. 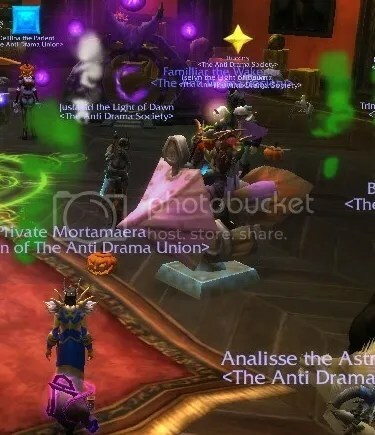 The other night, my guild on Proudmoore-US, The Anti-Drama Society, held their first Halloween party. 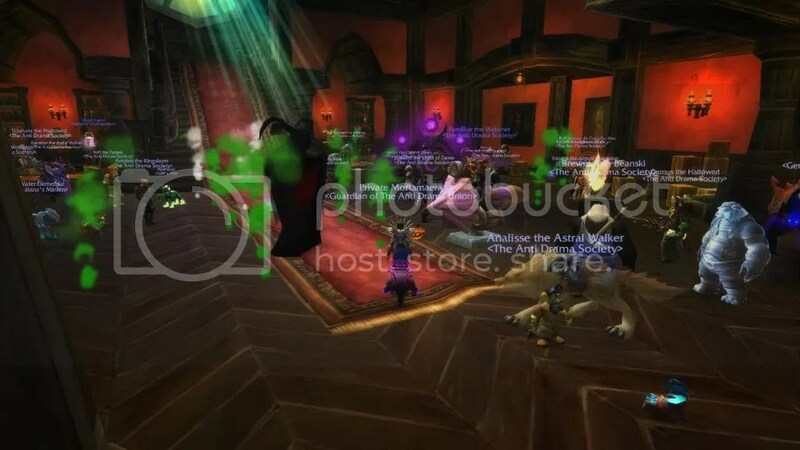 The party was held at Greymane Manor in Gilneas, where we had warlocks ready to summon everyone. We started the party with handouts of green and white smoke flares, paper zeppelin kits, Tasty Cupcakes, and a game item (a Steam Tonk Controller). 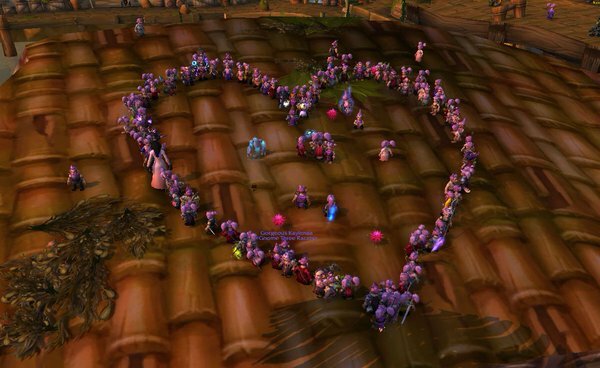 There were also wine kegs, feasts, Apple Pies (from Dalaran), and pony kegs laid down. 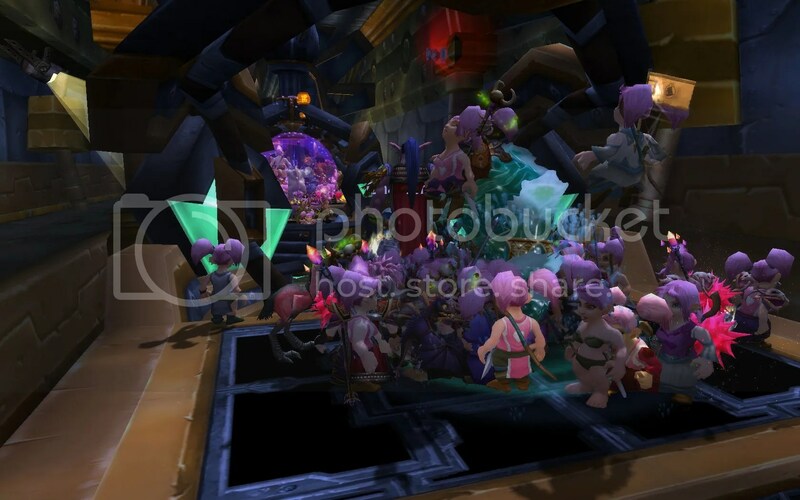 Member Wolfsage did a pet raffle during the party where she had everyone roll between 1-3. The roll would determine how many pets each person received. I got three pets including Teldrassil Sproutling and Anodized Robo Cub. Somewhere around 50-75 pets were given away during the party. We then lined up in a doorway to determine the costume contest winner. 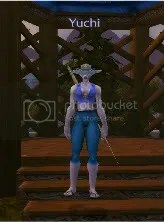 Trinarra was dressed as a Scary Pumpkin and won a Blood-Elf Bandit Mask. 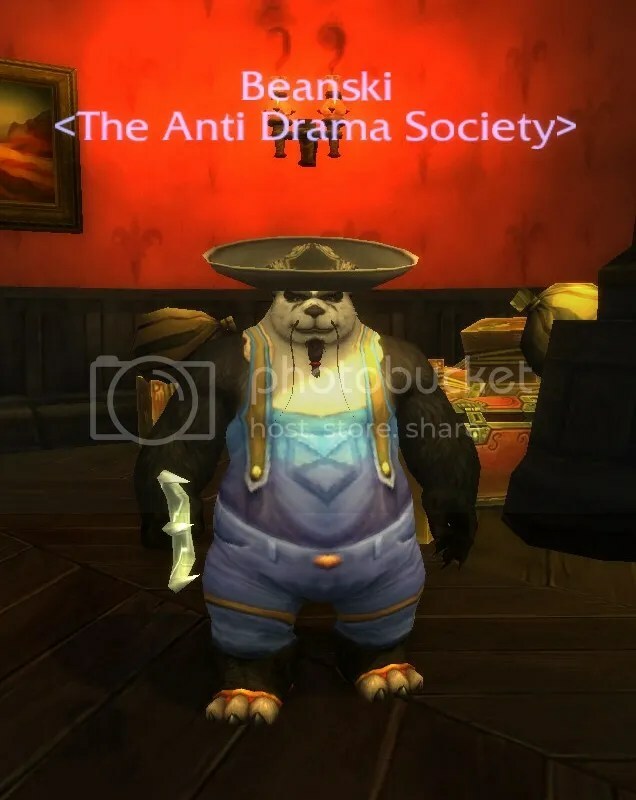 Beanski won a Brawler’s Pass for his farmer outfit. There was then a circle formed for the Steam Tonk Controller battles. We did four rounds of fighting with the last tonk standing as winner. Prizes given were: Mist-Piercing Goggles, Orange Martial Shirt + Lavender Shirt, and the Mystery Potion Package (Potion of luck x1 and Pygmy Pots x12). 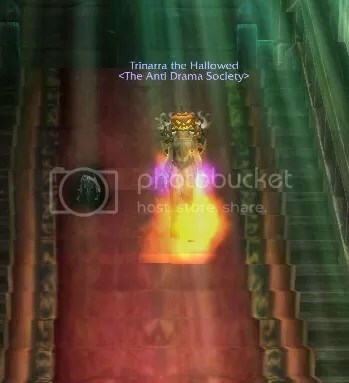 Wolfsage then did a Halloween trivia contest. There were three short rounds of questions- the round one winner got 10g, the round two winner got 20g, and the last round was one question worth 250g plus a rare pet. 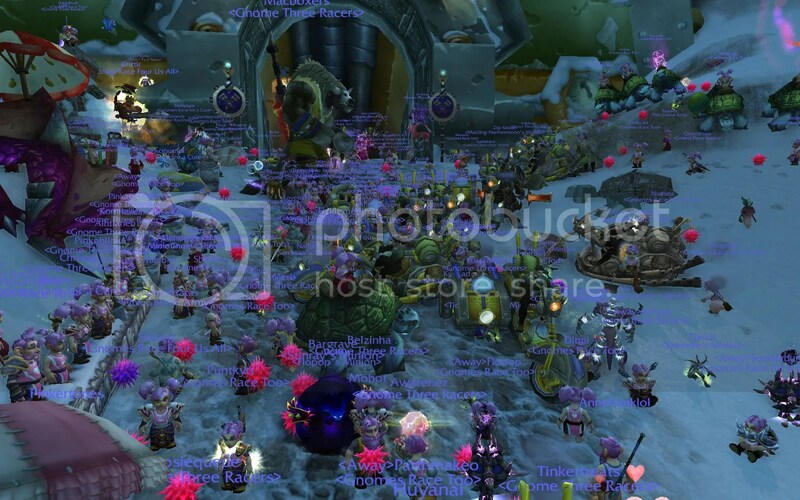 There were also Darkmoon “murloc” and Darkmoon “rocket” rides during the party compliments of Taysha. Prizes were mailed to winners after the party. 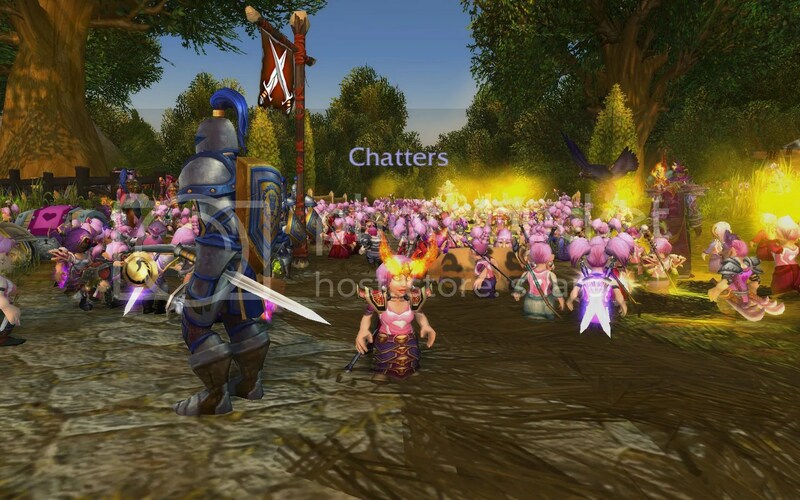 The party was a huge success for this large guild alliance of over 1000 toons. I would like to thank the GM, Isayuri, for letting me assist as activities committee chair. Also thanking Wolfsage, Ruccos, Ouliana, Deilana, Nift, Moy, and Rainelyn for all their help. * MADE BY ENGINEERS – some of these are new for Pandaria. The ones with (*) require a firework launcher, which engineers can make/use OR can be bought during festivals. After gathering all your fireworks, spread the word about your event in guild chat and/or trade. You will want everyone to gather in an open area. Fireworks usually only stack in 5s, which takes up a lot of bag space, plus you will want multiple fireworks going off at one time. For this reason, you will need volunteers to help you lay down fireworks. I usually give a few others stacks of fireworks that don’t require launchers. Fireworks events are always a hit, hope this list helps some of you out. 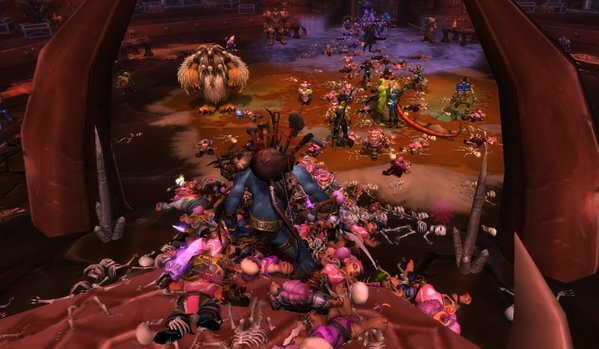 If only you could have all the WOW gifts you ever wanted, what would you ask for this Christmas? I looked around online, and these are some things I found that might be of interest! Note: None of these vendors paid me for their mentions, this is strictly my opinion/recommendation for current cool WOW gifts. 1.) Faction Print from Skahfee Studios on etsy.com. 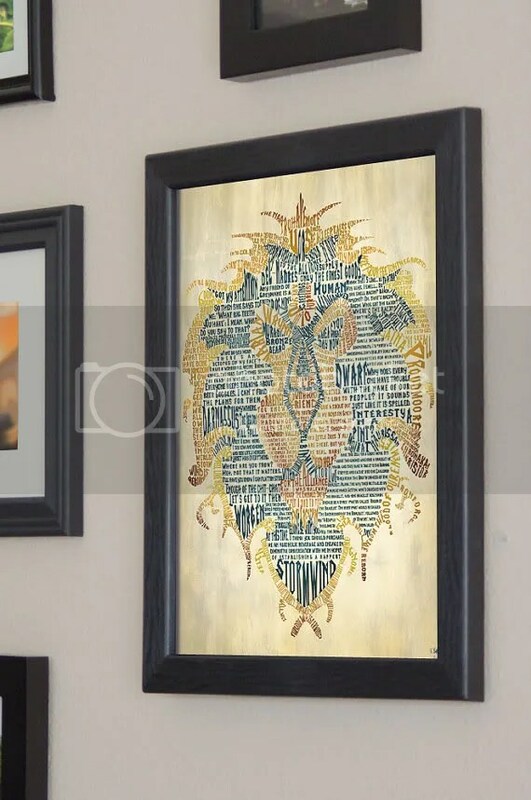 There are lots of warcraft items to choose from on etsy, but this is a new COOL item…you can get an alliance or horde print. The unframed print is $25, but you can get it framed for $40 (plus shipping). This seller requires you to order by Dec. 16th for Christmas arrival. 3.) 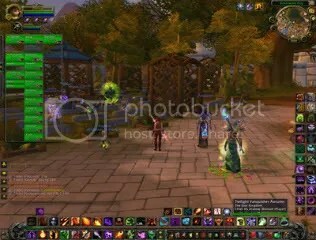 WOW Reading- War of the Ancients Archive. I am posting the link from Amazon.com because I order all my books from them so I know they have fast shipping…you can get this at any bookstore that carries it though most likely. 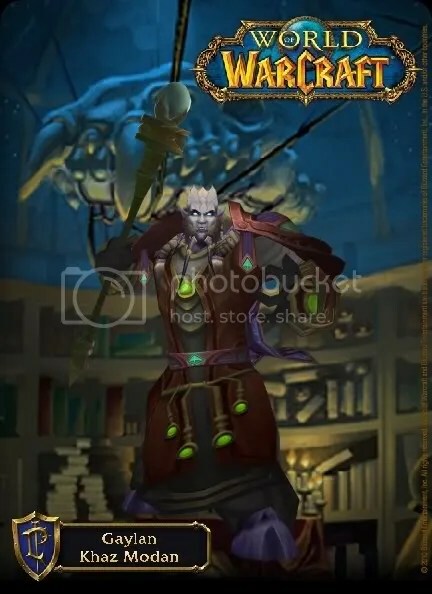 This is the first WOW book I have ever read, and it was EXCELLENT. 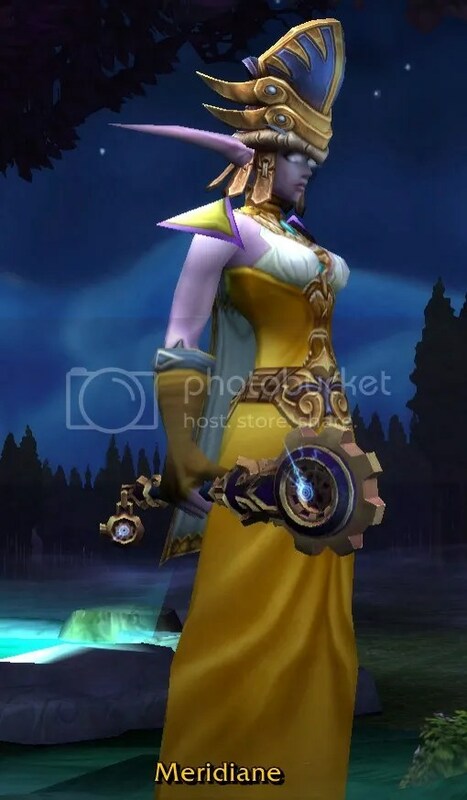 It contains three books in one set in the time of Queen Azshara. 4.) Soul Crusher Supreme Horde Necklace. 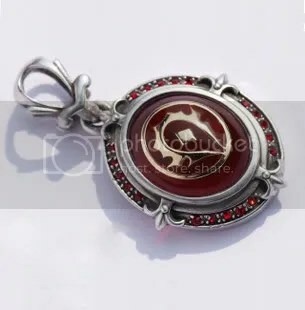 OK I am alliance, but I thought this necklace pendant was really pretty for the cost. It’s $29.99 at Theme’s Jewelry. They have nine available with worldwide shipping. 6.) WOW Loot Cards! I had never even see a WOW loot card until recently when we discovered you can buy them on ebay and amazon for fairly cheap. 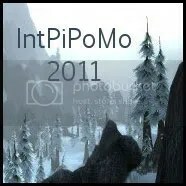 Here is a link to a whole slew of them at WowLootCards.com. 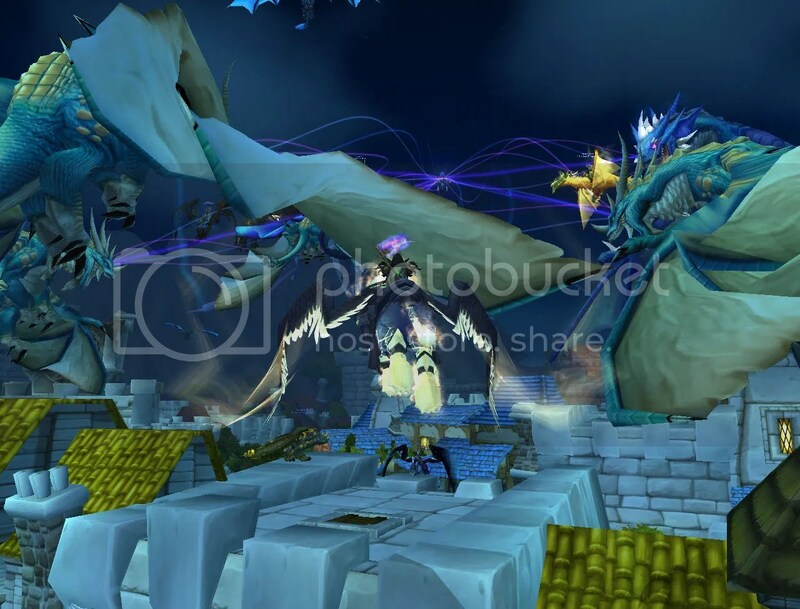 The mounts are the most expensive, but there are some that list as low as $5.50. My personal request would be the Disco ball! 7.) Better quality computer headphones! 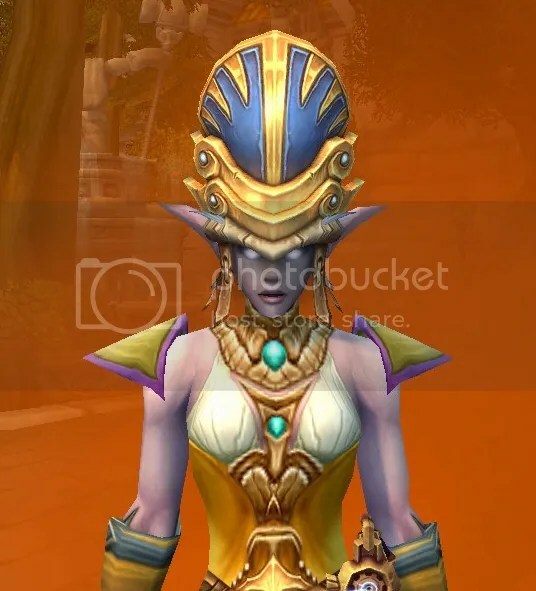 Between my previous pets and my current kids, I can’t count how many headsets I have gone through since I started playing WOW! If I had the money, I would go for these headphones, which are padded, ergonomic, and noise-reducing. 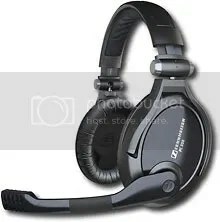 They are by Sennheiser from Best Buy. 8.) 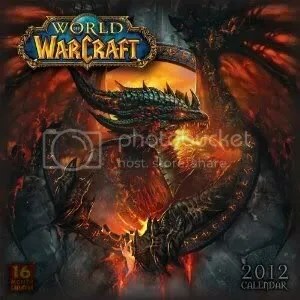 WOW 2012 Wall Calendar from Amazon.com. This is supposed to be one of the most beautiful calendars produced by WOW so far…maybe even worthy of framing. 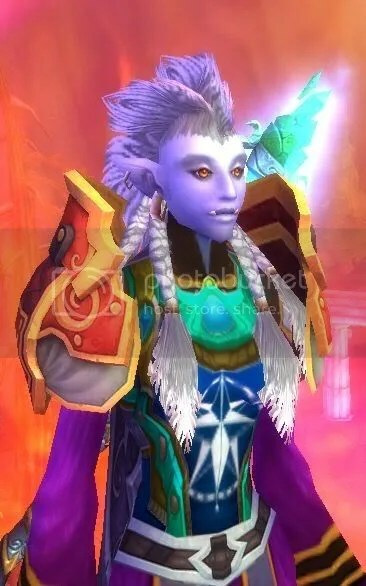 Each month features a different WOW leader. 9.) and 10.) 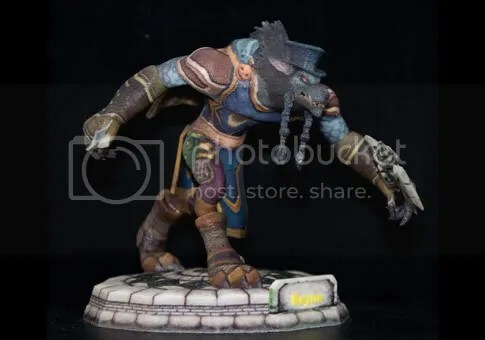 Printwarcraft.com is another destination for custom-made WOW items. You can design a mousepad for your toon or custom poster. You can add all kinds of things like your faction symbol or the Warcraft logo as well as choose from lots of cool backgrounds. Note: You have to sign in on this website, so not sure what the shipping policy is for Christmas. 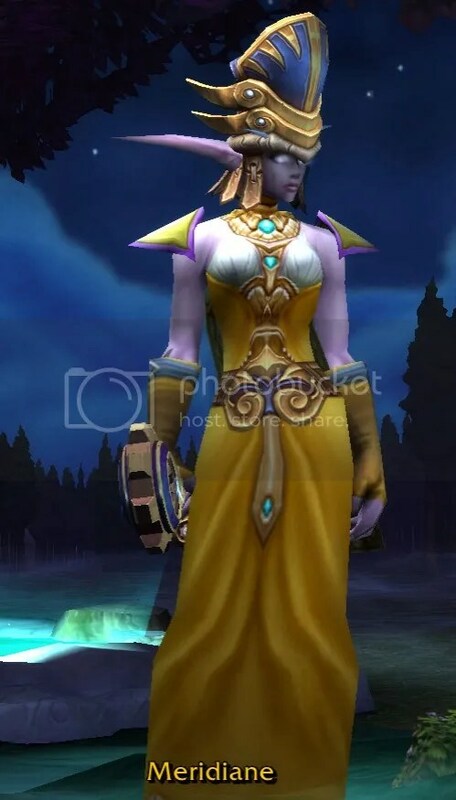 It only made sense that with guildies that love collecting outfits and transmogrification coming up- we should have a guild fashion show! We started promoting the fashion show early. Elemental Showdown: Put together one outfit describing an element: fire, air, water, life or earth. Profession: Dress up as any in-game profession or RL profession. 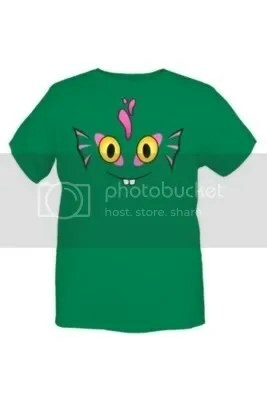 The Shirt: An outfit that uses a WOW shirt crafted or quest. Seasonal: Outfit that describes a season (summer, spring, winter, fall). Only one holiday item can be used. Accessory This! 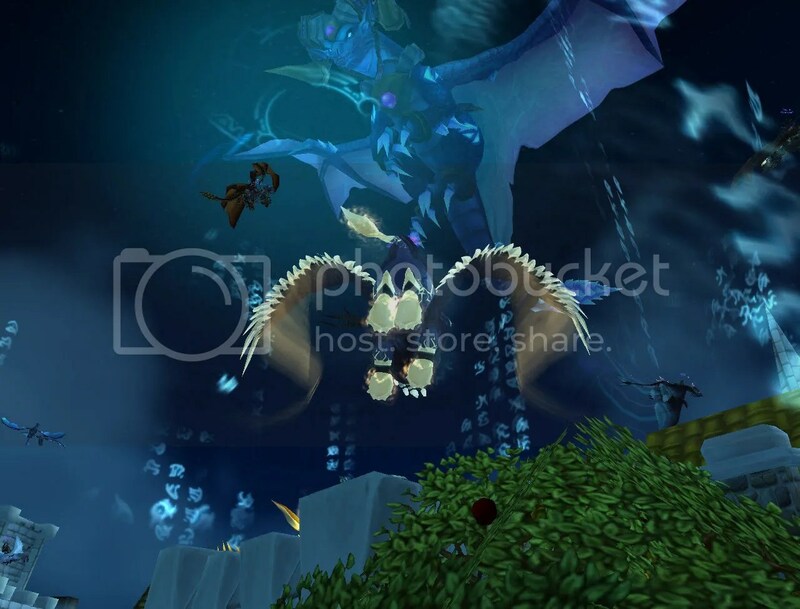 : Best use of a weapon, offhand, wand, companion pet, mount, or hunter pet with an outfit. 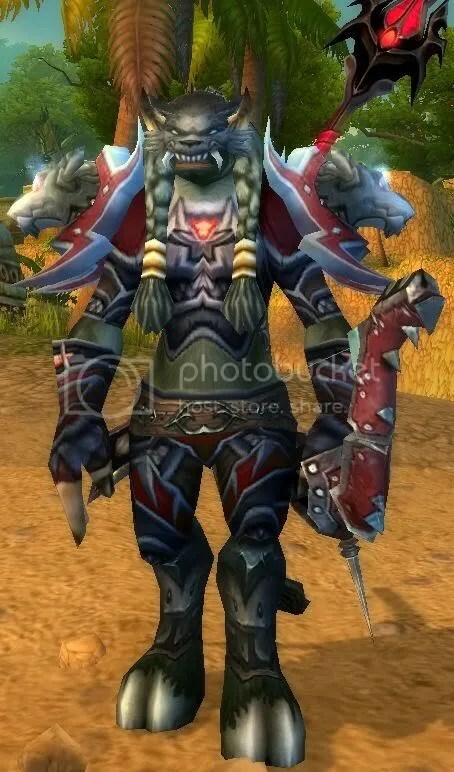 I’m really horde: Dress up as a villian. 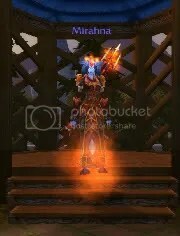 Your Class Through the years: One piece of armor from each expansion that shows you are a “insert class name here” (level 60, 70, 80, 85). Fashion, Huh? : For those that are new to dressing up. 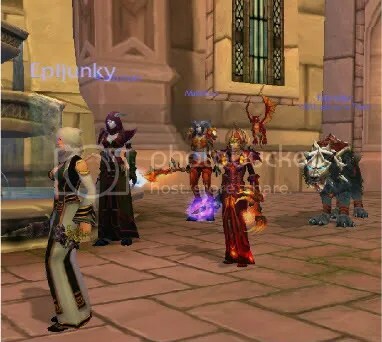 We had around seven guildies participating in the show and about that many or more in the audience. Audience members were given Origami Beetles and fireworks to use when they really liked an outfit. I asked three judges from outside the guild to attend, and they judged each category taking into consideration creativing and who the audience cheered for the most. Prizes worth around 100g were given for each category. We then had a Best Overall, which was voted on by everyone present. 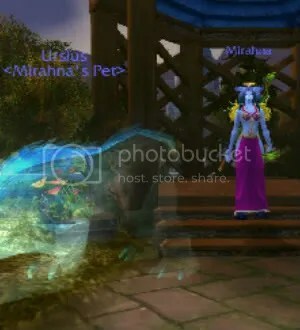 Mirhana was voted Best Overall, and she received the money for 310 riding. 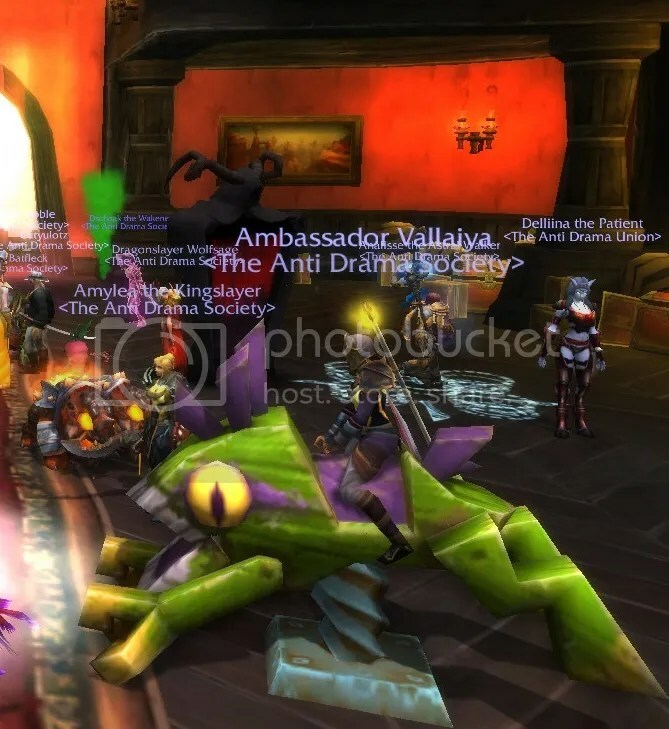 Someone asked me last night- so why a guild party? I explained that we have them every 3-4 months for fun and left it at that. 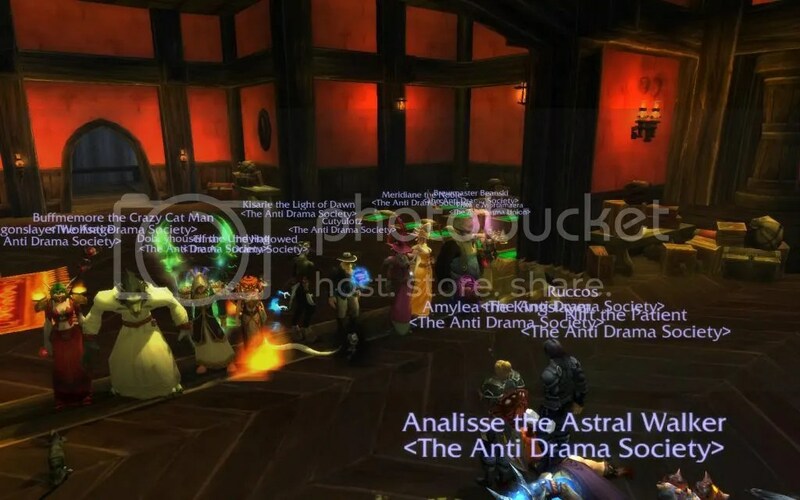 But again, a guild party is a good way to take a break from grinding as well as meet guildies you might not know so well. So last night, I hosted the “Guild Beach Par-tay” at a beach location just South of Caverns of Time in Tanaris. I picked this location because of the events we did during the party as well as the scenic quality. 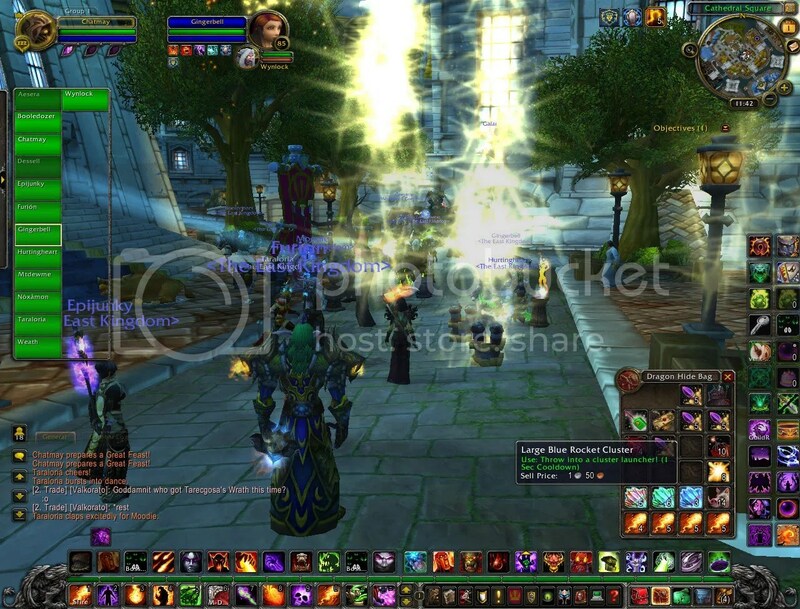 We mass summoned around 15 guildies to the beach. I had asked people to come wearing a summer costume for a chance at a prize. 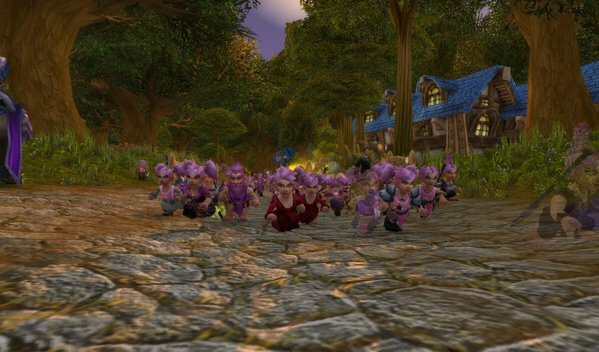 There were fire festival dresses, shorts, and bathing suits. Many had on sunglasses, goggles, and spectracles. I ended up not being able to pick a costume winner, so I gave away the Authentic Jr. Engineer Goggles to the winner of a roll. Probably would have been a better idea to have an actual out-of-guild judge there for that part of the party. I had announced also a “mystery prize” that had to be figured out. For example- whoever does “X” at the party first wins the prize. Since the activity was skinny-dipping first, I did give a hint when someone stripped that they were warmer. He ended up winning that prize, which was 50g. 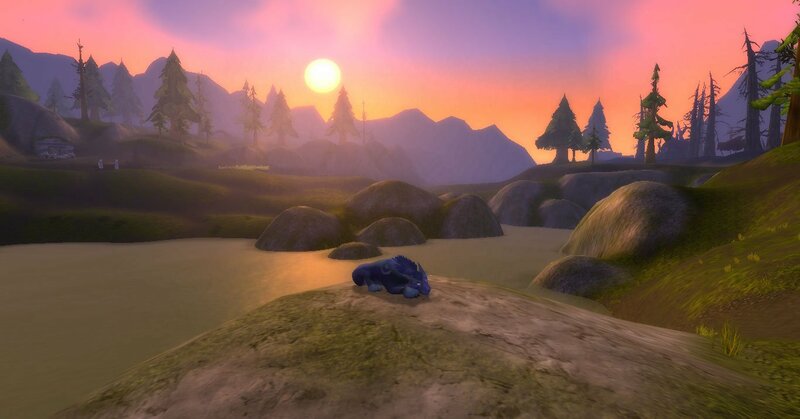 We also had held a sunset-themed screenshot contest on our facebook page, so that winner was picked by an inactive guildie and announced at the party. 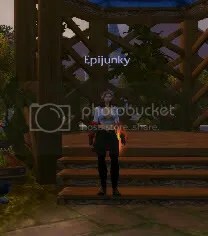 The guildie received 300g as the prize. There was the usual guild performance by Lady Gaga. Although her outfit was stunning (cindercloth set plus sandals and spectracles) if I do say so myself, I think she might need to come up with some new material. She did unveil the official pony keg though. I also handed out crafted heavy leather balls to each guildie, but during the party I forgot to have this contest. It was supposed to be a throwing frenzy for 30secs. I was going to give the companion pet prize of Lil’ Smoky to the guildie who received the most balls in bag, but this contest could be done in many different ways. The major draw to the beach portion of the party was the Lemmings 310 contest. 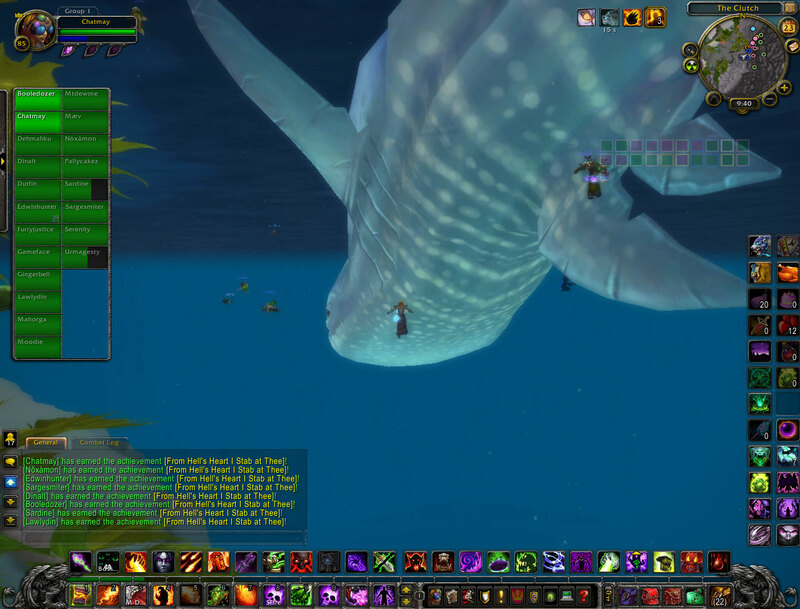 We had all guildies fly up to a cliff, jump off and die. 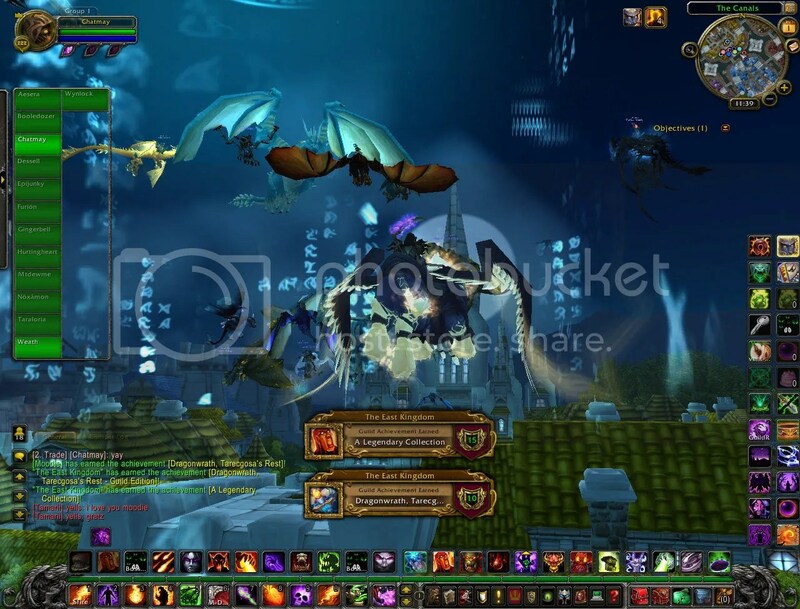 The winner was the guildie who landed the farthest away. He actually passed the prize, which was 310 riding money, to the second place person though. This was a lot of fun, but thank goodness for mass ressurection! Everyone who attended the party was sent savory deviate delights by mail as a parting gift. Overall lots of fun! EDIT: Mtdewme made a guild movie- the 2nd part covers this party. If you want to see it go here.